We had a great night for my sister's hen's night in the semi private space/ great room, service, food and Prosecco! Fantastic. My third time here and it never disappoints. Menu is different every time but all dishes are amazing. Cocktails are also brilliant and I'm not particularly a big cocktail fan. Have been just with my husband and then with groups of foodie friends - everyone very impressed. Keep up the great work. I'll be back! Food and ambience were great and service attentive. Unfortunately one wrong dish was served and another was forgotten. Shame - however I have been here before and will return. 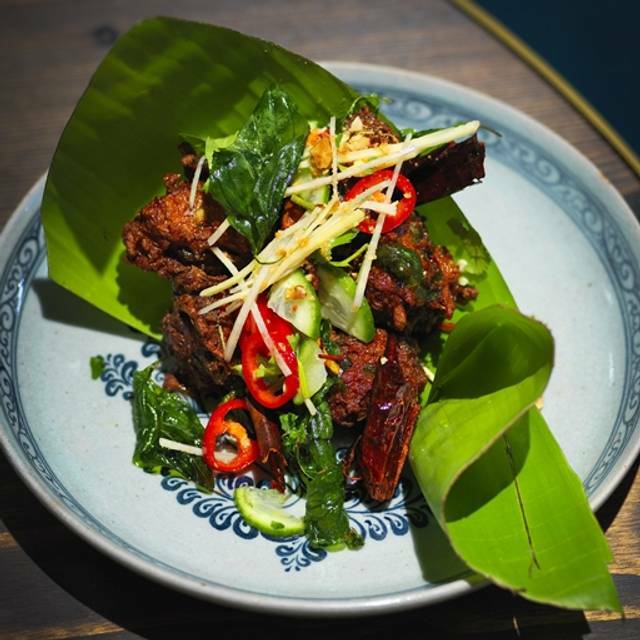 Thai street food but with a fine dining twist. We went for the 7 course tasting menu. It was good value for money @$68. The dishes matched well. The crispy prawns and satay chicken great. Squid was tough/overcooked. some more vegetables/ fresh elements would be nice. I'd definitely go back and try something on the a la carte menu. The only slight disappointment was the final sweet rice and coconut dessert. In itself not a bad dish but quite glutinous, needed some fresh fruit to balance it up. If you dont try it youre an idiot. They make everything from scratch. I was expecting much better food and service. The food was good but not great especially for the price. Do not order the squid it tastes very odd and the coconut cake dessert is embarrassing. The curries are delicious though. The service was very average and took over 25 mins to bring our first drinks which arrived after our mains. A bit disappointing. Nice decor , very traditional Thai food. Long Chim was fantastic! Delicious authentic food which transports you to Thailand! Our waiter Mag was very knowledgeable and helped us with lots of recommendations! If you don't like spice, this place isn't for you! They even brought out a candle with dessert for my mums Birthday which was so lovely! No fuss made at all!!! Would recommend!!!!! I had high expectations for Long Chim, having dined at several upmarket Thai restaurants in other parts of Sydney. The good points are that the service was friendly and attentive, and the wine list was very good with an extensive selection of Rieslings and other German varietals. But the food was disappointing and very poor value for money. We ordered the red duck curry ($38) and pork pineapple curry ($32) -- both of which were laden with unsavoury bone and gristle. Cannot recommend. We had the Tasting Menu and everything we had was delicious. Our waitress was wonderful and so helpful, nothing was too much trouble. Will be back again. All dishes ordered were very tasty. While I do not mind paying high prices for good food, and they are very pricey, the sizes of the dishes were however shocking. All dishes ordered were extremely small in size. The Smashed Prawn Curry at $38, very delicious, was barely enough liquid to cover the bottom of the bowl it was served in. Four of us left after spending $220 on food with happy palates, but hungry stomachs. Went to Long Chim for my mothers birthday last night. We had a great meal. My mum can't stand a lot of chilli, while I love it. They accommodated both of our tastes even with their share plate philosophy and the waiters had a really good understanding of how hot the food would be. The food tasted amazing and I will definitely go back. This was my second visit to Long Chim and I loved it just as much as first time around. The food is a good few notches above your standard suburban Thai, both in terms of quality and variety. There some familiar dishes (eg: pad Thai, massaman curry) but done with much more finesse; plus plenty of options that you don't generally see (soft shell crab, duck egg omelette). Our 1st time to this restaurant, really great spot. Food was super good and really enjoyed the buzz. Great place for cocktails and tasty food. Some dishes were too spicy for my palette but overall solid dining experience with impressive standard of service. The restaurant did cater for me, the only fish eating "vegetarian" at our table of 4, although it was rather hard to organise beforehand, and we did try on many occasions. The staff were very attentive and were more than pleasant. I have to add that the food did not live up to expectations, which perhaps were unreasonably high given the hype surrounding the visiting chef and the restaurant itself, and of course, the high cost per person. Amazing food. We were just a little disappointed in the recent transformation from a smallish, vibrant restaurant into a big, industrial style restaurant that aims to squeeze in as many guests as possible. While the ambience was nice, it was pretty noisy and a bit tight, also the seats were replaced with cheap quality, metal stools instead of chairs. However, the food definitely makes up for it and the staff are wonderful. Would still recommend- perhaps ask for a quiet corner. I have been to Long Chim several times now and it never dissapoints. I found this place by mistake and so gald that I did. On this trip I brought my family as we were heading to Thailand the next day. What a great way to start our family holiday. Nahm was next on our list. 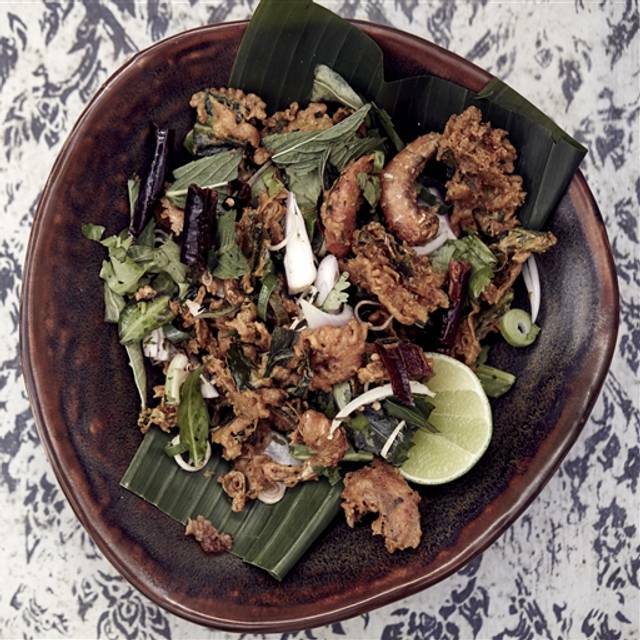 My husband and I remember enjoying Darley St Thai in the 80s and were keen to try Long Chim. It did not disappoint. It will be difficult to eat a our local Thai restaurant after Long Chim. The service and advice about what to order were all very good and appreciated. Interesting venue with lots to catch your eye over the evening. Service was prompt and authentic. Cocktail (Grapefruit Spritz) was delicious. Portions were perfect and we could have ordered one less starter (was difficult as they all look divine). The bathrooms were also very modern and loved that they are unisex. A nice range of authentic Thai dishes with very real level of Thai spice. Staff very friendly and able to advise on dishes. Some nice cocktails but not an inspiring wine list. Overall much better than your local Thai but priced accordingly. An excellent night out,great food,friendly professional staff and a vibrant feel to the place. amazing fish cakes. other dishes nice too. Could do with some more description re dishes on the menu to aid choices. We went there for a pre-concert dinner as part of a package with the concert provider. The pre-set menu started arriving within minutes and kept arriving far faster than we could eat it. We were a table of two set immediately adjacent to a 20+ group and were unable to converse across the table. We got out as soon as we could and went elsewhere for coffee. Although the published menu doesn't have many vegetarian options - the waitress provided many choices and it was all absolutely delicious. Our visit was for a pre-concert visit before going to City Recital Hall. Quick, friendly service. Would definitely go again and recommend to friends. Fantastic food and service, best Thai I've tasted. Left feeling like I'd gone to foodie heaven. Came for a solo visit after seeing Long Chim owner on masterchef - I had a couple of hours at large between meetings. Not disappointed, although I thought the set menu was different to what was advertised on the website - but I could have been wrong or it might have changed - all fine. Food surprised me - unconventional "Thai" but very close to thai street food expectations. Some unusual textures and flavours had me cleaning out every dish. Not too much food, and the ice-cream was excellent. Service unfortunately let it down, entrees bought out separately and far apart - not asked. Long delays with no service at all despite waving a few times to wait staff - drinks not noticed empty & had advised wanted to order wine for main meal - drinks menu left on table. Did dampen our experience! Shame.